You sit down and eat a good meal, but when you get up from the table you still don’t feel satisfied. You’ve eaten plenty but your body keeps insisting you need to eat more, that you are still hungry. This message can feel almost impossible to resist. If you’re like most of us, you eventually find yourself rooting through the refrigerator for that perfect food to calm those cravings. And, of course, that overindulging catches up with us causing us to gain weight. So where do those hungry cravings come from? It turns out that feeling that we’ve had enough to eat—known as satiety—is as much a function of brain chemistry as it is your stomach. If your brain isn’t getting the appropriate signals, regardless of how much you’ve eaten you feel unsatisfied. It’s not even REAL hunger really; it’s purely the desire to eat more. This can be especially troubling when you’re trying to lose the holiday half dozen—that sneaky handful of pounds that many of us pack on starting in November. The good news is you can USE food (and supplements) to cancel those cravings, eat less and lose weight. Like so many biological functions, feeling full and satisfied is actually governed in part by your hormones. One of these hormones is leptin, which is part of a complex system of biochemical signaling that influences feelings of hunger and food satisfaction. If you have a leptin imbalance you’re almost never satisfied. Diminished hormone levels continually tell your body that you’re in the middle of a famine and you need to eat more to survive. The other important hunger-related hormone is ghrelin. While leptin signals us to feel satisfied, grehlin has the opposite message, telling us that we’re hungry. Ideally, after a meal, grehlin levels drop, while leptin increases. However, it doesn’t always work that way. These hormone signals can become imbalanced, and their receptors can become desensitized. For example, fructose appears to cause leptin resistance, which can lead you to feel hungry all the time. Reduce the fructose and leptin may be able to do its job more effectively, you end up feeling more satisfied and as a result you eat less. These relationships are complex and appear to be influenced by gender, weight and other factors that researchers are just beginning to sort out. However, studies have shown that lifestyle, supplements and specific foods can help balance your hunger signals and feelings of satisfaction. 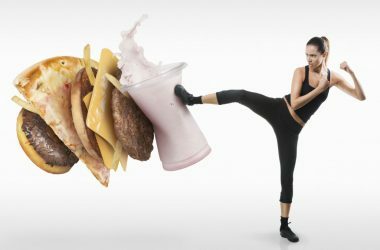 It seems counterintuitive, but one of the very best ways to feel comfortably full and satisfied is to cut back on high calorie foods such as fatty meats, cheeses, snack foods, butter and fried foods. While these foods pack in a lot of calories and can make you feel temporarily full (even too full), they don’t leave you feeling satisfied for long. Before you know it your cravings return with a vengeance. On the other hand, if you eat more low-calorie foods, you’re actually going to be more satisfied and you’ll be less likely to go back for seconds and thirds. That’s because unlike the high-calorie junk, most low calorie foods tend to be fiber-rich and water-filled which leave you feeling full and energized for far longer. Fruits and vegetables are ideal foods for staving off hunger pains over the long haul, which is great news, since they’re also packed full of nutrients. Sprouted grains, beans and lean protein are next on the list. There are a number of nutrients and botanicals that can help you feel full and stave off hunger cravings. Alginates, which are extracted from brown seaweed, showed similar results in another study.4 They can also be effective when combined with pectin.5 A study published in the American Journal of Clinical Nutrition found a beverage with this combination increased satiety. These items are all easy to find. In my own practice, I often recommend an integrative metabolic formula, which includes chromium, alginates, fenugreek as well as the amino acids alpha-lipoic acid and l-taurine plus other targeted botanicals. This combo supports glucose metabolism, promotes fat and sugar metabolism and, importantly, helps control cravings while increasing satiety. Another way to increase satisfaction from meals is to simply cook and eat mindfully. A colorful presentation of diverse whole foods will appeal to your senses and unconsciously signifies nutritional value leading to greater feelings of satisfaction every time you eat. Chewing food slowly and thoroughly allows enough time for the hormonal signals from the digestive tract to reach your brain, telling you you’ve had enough to eat. Chewing food longer also increases nutrient absorption in your gut, so you get more nutritional value and, as a result, you feel more satisfied. Our relationship with food is a complex one. It’s not just how much you consume, but also what, when and how you eat. But the right foods, habits and supplements can help you gain the upper hand leaving you feeling full, satisfied and healthy. And helping you shed that extra holiday weight too! 1.”A satiety index of common foods.” Eur J Clin Nutr. 1995 Sep;49(9):675-90. 2. “Effects of chromium picolinate on food intake and satiety,” Diabetes Technol Ther. 2008 Oct;10(5):405-12. doi: 10.1089/dia.2007.0292. 4. “Acute Effect of Alginate-Based Preload on Satiety Feelings, Energy Intake, and Gastric Emptying Rate in Healthy Subjects,” Obesity, Volume 20, Issue 9, pages 1851–1858, September 2012. 5. “Novel calcium-gelled, alginate-pectin beverage reduced energy intake in nondieting overweight and obese women: interactions with dietary restraint status,” Am J Clin Nutr. 2007 Dec;86(6):1595-602. 6. “Does green tea affect postprandial glucose, insulin and satiety in healthy subjects: a randomized controlled trial,” Nutr J. 2010 Nov 30;9:63. doi: 10.1186/1475-2891-9-63.